- Pomegranate provides relief from stomach disorders, protects against heart ailments, maintains blood sugar levels and blood pressure, and reduces risk of developing cancer. It also lowers dental plaque and helps reduce symptoms of anemia. In addition, it provides youthful and glowing skin. And helps overcome depression. - Quinoa is anti-oxidant, gluten-free, full of vitamins and minerals, high in protein content, great magnesium source and very high in fiber. In addition, it assists metabolism and help with weight loss. - Mint is a blood cleanser. It also soothes the digestive tract, eliminates toxins from the body, reduces the growth of bacteria and fungus and helps in curing asthma. In addition, it whitens teeth and combats bad breath and prevents colon, skin and lung cancer. - Olive oil is rich in mono-saturated fats which helps protect against Type II diabetes. It helps with weight loss; maintain healthy heart, lower blood pressure, keeps healthy bones and healthy skin. In addition, it helps prevents colon and skin cancer. - Apple cider vinegar relieves constipation, fights acid reflux, promotes good gut bacteria, cures Candida, flush harmful toxins from the body, regulates pH, lower blood pressure, balances blood sugar, fight cancer, fight allergies, helps with weight loss, clears sinuses and fight colds. 1. Combine the quinoa with the water and bring to boil. Turn heat on low and cook semi-covered for 20 minutes, or until water is absorbed. Then let cool for 5 minutes. 2. 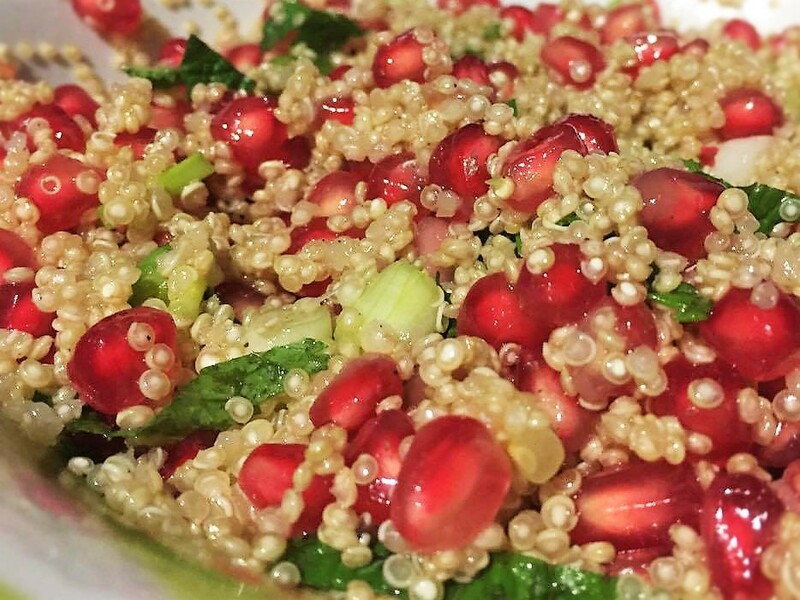 Stir in pomegranate seeds, green onion and sliced mint. 3. Add apple cider vinegar, olive oil and salt and pepper.